March 20, 2011 - Meteorological Evaluation Towers (METs) are used to measure wind speed and direction during the development of wind energy conversion facilities. METs are made from galvanized tubing (or other galvanized structure) with a diameter of 6 to 8 inches and are secured with guy wires that connect at multiple heights on the MET and anchor on the ground. Many METs fall just below the 200-foot Federal Aviation Administration (FAA) threshold for obstruction markings. They can also be erected quickly and without notice to the local aviation community, depending upon their location. Because of their size and color, pilots have reported difficulty seeing METs from the air. Therefore, METs could interfere with low-flying aircraft operations, including those involving helicopter emergency medical services, law enforcement, animal damage control, fish and wildlife, agriculture, and aerial fire suppression. The NTSB has investigated several fatal accidents involving aircraft collisions with METs. On January 10, 2011, at 1057 Pacific standard time, N4977X, a Rockwell International S-2R, impacted a meteorological tower (met tower) during an aerial application on Webb Tract Island, Oakley, California. The airplane sustained substantial damage and the pilot was killed. Alexander Ag Flying Service Incorporated was operating the airplane under the provisions of Title 14 Code of Federal Regulations Part 137. Visual meteorological conditions prevailed and no flight plan was filed. According to the Federal Aviation Administration inspector that responded to the accident site, the pilot had been applying seed when the accident occurred. Witnesses indicated that the pilot overflew the area and then began a pass over the field. Witnesses did not report seeing the airplane perform any evasive maneuvers prior to the impact. The fact that these towers are narrow, unmarked, and grey in color makes for a structure that is nearly invisible under some atmospheric conditions. 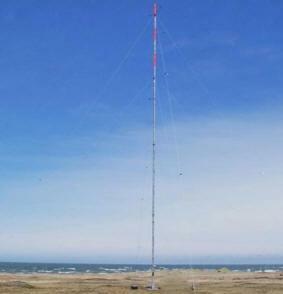 The land owner indicated that the met tower on Webb Tract Island was erected in April 2009. The project description stated that the tower stood 197 feet 8.25 inches tall and was designed specifically for wind resource measurements. Additionally, it stated "The 60-meter (197 feet) tower is lower than the 200 feet threshold set by the FAA, and as such meets FAA regulations." On May 19, 2005, an Air Tractor AT-602, N9017Z, collided with a MET that was erected 15 days before the accident in Ralls, Texas. The 21,000-hour pilot had completed his second aerial application on an area of trees, and was en route back to the airport. While maneuvering, the airplane struck a 197-foot high tower. Subsequently, the airplane impacted terrain, where a post impact fire ensued. There were no reported eyewitnesses to the collision with the tower. Examination of the airplane and accident site revealed that the outboard portion of the right wing was separated and found adjacent to the base of the tower. The top three feet of the tower was severed and had yellow paint transfer consistent with the color of the airplane. The tower was erected 15 days prior to the accident and was of an unpainted metal color. The tower was also not equipped with an obstruction light. A weather observation system approximately 29 miles northwest of the accident site reported an overcast cloud ceiling at 25,000 feet. On December 15, 2003, an Erickson SHA Glasair, N434SW, collided with a MET near Vansycle, Oregon. The pilot and passenger departed Yakima destined for Walla Walla, Washington, and en route flew through an area of wind turbines and associated anemometer poles measuring 50 meters in height. An ear witness reported hearing an explosive sound and noted smoke in the direction of the sound. Upon investigating the sound, the witness discovered the aircraft ground impact site about 1000 feet east-northeast of a broken anemometer pole. Visual meteorological conditions existed at the accident site and the pilot had logged more than 11,200 hours of flight experience. The FAA has issued a notice of proposed rulemaking (docket number FAA-2010-1326) to update Advisory Circular (AC) 70/7460-1K to recommend the marking of METs. However, the NTSB is concerned that the application of the AC is voluntary, and, without mandatory application and marking requirements for METs, many METs will still be constructed without notice to the aviation community and will fail to be marked appropriately. What can pilots do to avoid METs? Maintain vigilance for METs when conducting low-altitude flights. If you locate a MET in your area, let other pilots know about the location of the MET. FAA Safety Team members are also exploring methods of notifying pilots of the location and height of METs and are working to educate MET owners, builders, and communities on the flight-safety issues presented by METs.